When you plan your finances, be realistic about what you want to achieve and how to go about attaining your goals. How achievable is the goal? Do I have the resources to get there? How do I intend to achieve my objective? What’s my plan? Make sure not to approach your financial goals in the same way that a sloppy chess player plays a game of chess. When a chess player brings out his queen at the start of the game, before developing an effective strategy, it’s highly doubtful there will be a successful outcome. Chances are, he will lose his queen, the strongest piece, right at the beginning and end up defeated. Similarly, if you tackle your financial goals without a coherent plan or strategy, success will be elusive. One of the ways to play chess successfully is to make sure you have pieces to support your more active pieces in the frontline. In the same way, when building your financial plan, be aware that things may not go the way you intend. Markets can be volatile, and also life happens. Think of backup possibilities and be prepared to change your tactics if it becomes necessary. For example, make sure that you have an emergency fund in place to deal with unexpected crises rather than having to dip into your savings. 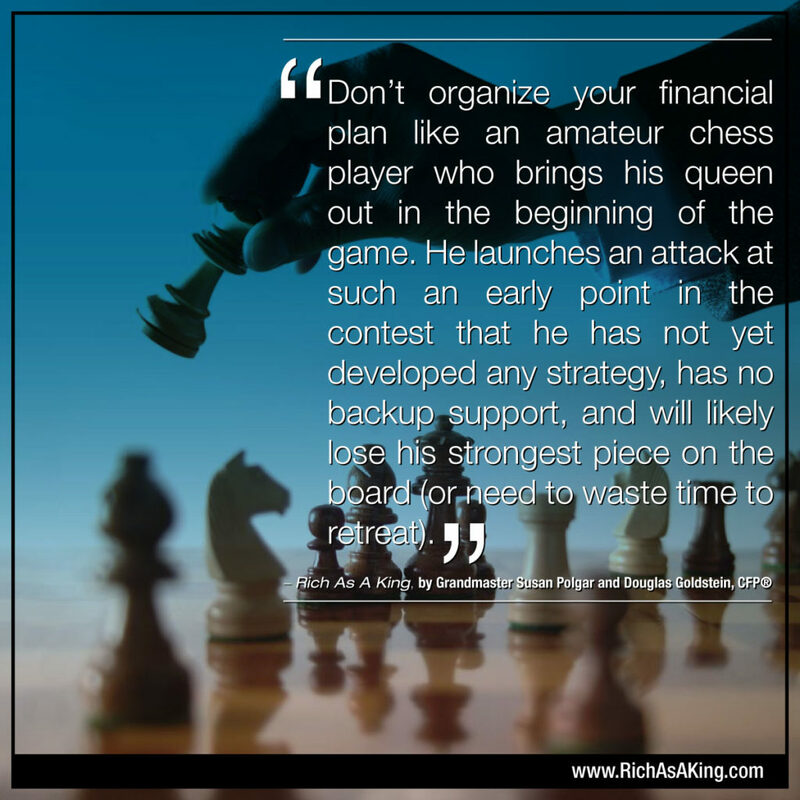 When you create a financial plan, follow the approach of a professional chess player. Allot your resources carefully, rather than spreading yourself too thinly. Look at your goals individually, but also try to see how they relate to and with each other as part of the big picture. Develop a specific strategy, consisting of a series of short-term steps that will lead you to achieve your objectives. Keep your ultimate goals in mind all the time, while being practical and planning carefully. For more about how to build an effective financial plan, listen to this podcast.